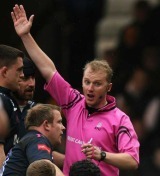 English referee Wayne Barnes became a professional referee in 2005 giving up a career in law to do so. He was, when appointed, the youngest referee to ever be selected for the Panel of National Referees in 2001 aged just 21. He then went on to referee at the 2003 Under-19 World Cup in France and the 2005 Under-21 Rugby World Cup in Argentina. He went fully professional in April 2005 and made his Test debut in 2006 as he oversaw three matches in the Pacific Five Nations tournament. In April 2007, he was selected to officiate in the 2007 Rugby World Cup in France. His tournament though came to a contentious finish as New Zealand were knocked out of the tournament by hosts France at the quarter-final stage. Barnes sent Luke McAlister to the sin-bin and missed a forward pass in the lead-up to France's match-winning try as the All Blacks lost 20-18 after which Barnes received death threats. However, there were few complaints with his performance when the All Blacks subsequently beat Scotland in Edinburgh a year later. He also became the first English official ever to take charge of a match at Croke Park in Dublin as he oversaw Wales against Ireland in the 2008 Six Nations Championship, won 16-12 by the Welsh. The Englishman also took charge of the British & Irish Lions tour clash with the Cheetahs in 2009 and his first tri-Nations clash later the same year when he was the man in them middle for Austraila's clash with South Africa in Brisbane. He also served as an assistant for New Zealand's match with South Africa in Hamilton and Australia in Wellington. Later he was handed the Air New Zealand Cup fixture between Wellington in Southland and his performances were praised by the country's leading officials.